"A local restaurant served a version of this recipe. I went crazy over it and decided to create my own. It's great served warm or cold." In a large mixing bowl, mix eggs, milk, sugar, and vanilla until smooth. 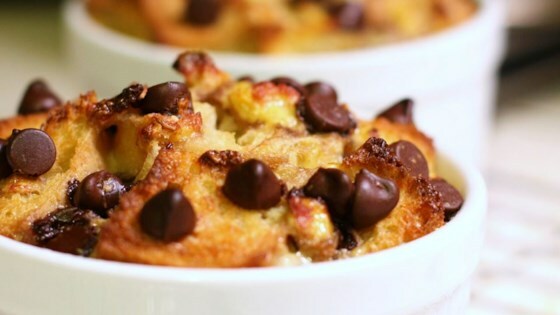 Stir in bread, bananas, and chocolate chips, and let rest 5 minutes for bread to soak. Pour into prepared pan. Line a roasting pan with a damp kitchen towel. Place loaf pan on towel inside roasting pan, and place roasting pan on oven rack. Fill roasting pan with water to reach halfway up the sides of the loaf pan. Bake in preheated oven for 1 hour, or until a knife inserted in the center comes out clean.